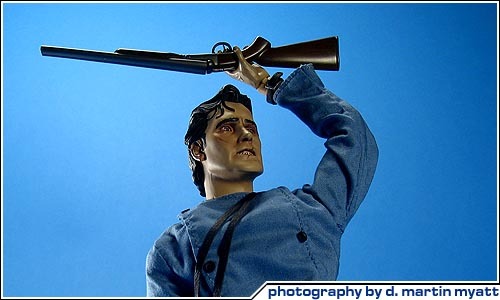 Comments: This 12" figure features an amazing likeness of Bruce Campbell. This figure's medieval shirt, trousers, socks, waist belt and cape with round buckle are from the final battle sequence. The figure will also come with a shoulder slung shotgun boot, shoulder slung chain saw sling, Death dealing chain saw hand held or arm inserted, 'Boom stick' shotgun, 'Groovy' gauntlet hand, hiking boots, wristwatch and stone display base.